On Thursday, October 25th, the Washington Square Review took the literary sphere into its own hands and launched its 42nd issue of the loved literary journal. 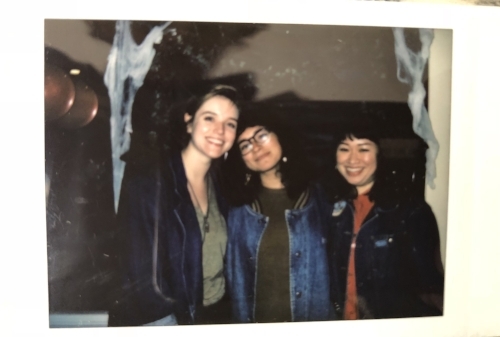 Contributors Marwa Helal, Cynthia Cruz, and Lincoln Michel kicked off the night with their pieces from the new issue as well as some of their own readings. Whoever said writers don’t know how to party didn’t come to Washington Square Review’s Issue 42 Launch Party. If you couldn’t make the party, we are here to tell you about everything you missed. Maddie Mori, poetry MFA alumni, introducing Marwa Helal. Marwa Helal, introduced by Maddie Mori, is the author of Invasive species (Nightboat Books, 2019) and the winner of BOMB Magazine’s Biennial 2016 Poetry Contest. She has been awarded fellowships from Poets House, Brooklyn Poets, and Cave Canem. Sonia Feigelson, second year fiction MFA candidate, introducing Lincoln Michel. Lincoln Michel, introduced by Sonia Feigelson, is the author of Upright Beasts, a collection of short stories (Coffee House Press, 2015) and the co-editor of the anthology Tiny Crimes, His fiction and criticism appear in The Paris Review, The New York Times, BOMB, NOON, The Believer, and elsewhere. His story “What the Landlord Knows” from Issue 42 can be read on our website here. Hannah Hirsh, second year poetry MFA candidate, introducing Cynthia Cruz. Cynthia Cruz introduced by Hannah Hirsh, is the author of five collections of poetry: How the End Begins; Wunderkammer; The Glimmering Room; Ruin; and Dregs (Four Way Books, September 2018). We may be biased in saying that the happiness and excitement of everyone in attendance lasted through the duration of the evening, but that is just a risk we have to take. We took into account that it was close to Halloween, and we decorated our photo booth full of cobwebs and fake flowers (thank you, A.C Moore.) Polaroids were taken over the sweet sound of champagne bottles being popped. If you have yet to buy the newest issue, we forgive you, beautiful people! Just click on over here and we got you covered. In the meantime, do not hesitate to follow us via Twitter, Instagram, and Facebook.